A Variety of Travel Styles! Guests on our trips can sometimes have varying ability levels and different expectations when it comes to the physical nature of a tour. Because this can be challenging in a group travel setting we offer different “travel styles” to ensure YOU are getting YOUR best trip possible! When selecting a Backcountry Journeys tour you can be assured that no matter which tour you pick that we will provide the same world-class service, personal attention, and an overall seamless adventure travel experience. But we’d encourage you to seriously consider and decide on the tour style before registering because there can be a notable difference in activity level between the two styles. This is a detail that can be the difference between you having a tour that is just right for you, or perhaps completely wrong. Each tour will clearly note which style category it falls into. But what does ‘standard’ and ‘hiker photo’ really mean? ‘Standard’ tours will involve nearly no hiking or extensive walking whatsoever. The majority of our shots on ‘standard’ tours will be designed so as to require little physically from you to get to “the shot.” This being said, our tours typically are visiting National Parks and other wild places that are off the beaten-path. Even on ‘standard’ tours, you will need to be able to maneuver in-and-out of vehicles as well as be able to physically handle some uneven terrain and short distance walks (think from a parking lot to a vantage point). If you register for a ‘standard’ tour, please expect shots that require hiking or extensive scrambling will NOT be on the itinerary, even if they are nearby. These tours will have a “difficulty” rating of 1. ‘Hiker Photo’ tours will involve some hiking necessary to reach some of our shot locations. If a particular shot requires a hike to achieve, the tour will earn the ‘hiker’ indication. 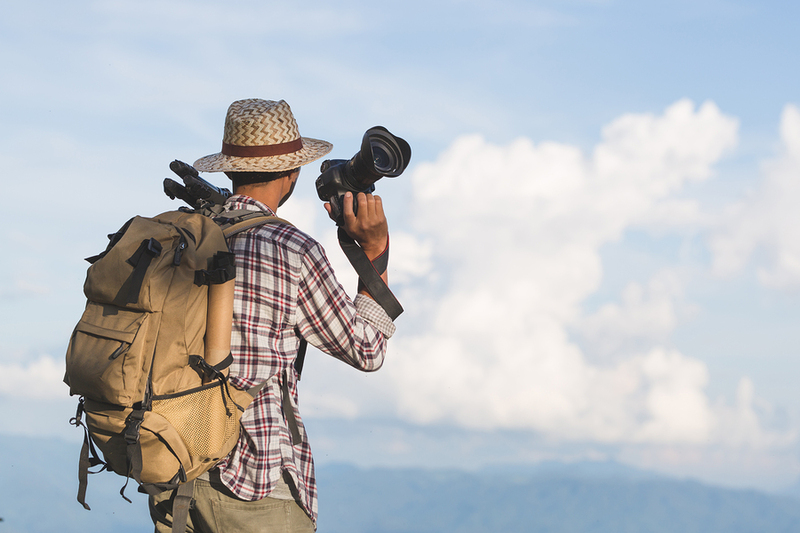 Please note that ‘hiker’ tours are still photography-based, and as such daily activities will be designed around the photography schedule – with photography being the prime objective. Please reference the day-to-day itinerary to ensure you are familiar with the extent of the hiking involved so that your expectations are properly met. The extent and difficulty of hiking on ‘hiker photo ‘tours will be indicated with a sliding scale “difficulty” rating between 1 (easiest) – 5 (most difficult) as described below. Activities include light walking along maintained dirt trails and pathways with your camera gear. Mileage is generally between three and five miles, however, elevation gain will not be more than a few hundred feet. Activities include walking and hiking along trails that may have more significant elevation gain. Mileage is generally between four and seven miles and elevation gain may be up to 1,500 feet. Trails may be uneven, rocky and slippery. Activities include hiking on more challenging trails that are steep, uneven and with elevation gain up to 2,500 feet. Mileage will vary but can range from five to nine miles. Our most challenging activity level for those who like to really push it. Activities include steep hiking on rough, rugged trails and often in trail-less wilderness areas. Expect significant elevation gain and lots of sweat! Backcountry Journeys also offers a variety of travel styles and lodging options which include lodge-based trips, camping trips, safaris and trips that are largely boat-based! See the specific trip itinerary for more information. We’ll be staying in comfy lodges, near or inside the National Parks that we are visiting. These trips can be either “Standard” or “Hiker Photo” in style. Either way, we’ll be enjoying a comfy lodge at night. Our lodging on these trip types will be eco-based wilderness lodges. Eco lodges tend to be more remote, located in relatively pristine natural environments such as beaches, jungles and mountains. The locations are superb but these are often rustic locations without all the modern amenities. While we’ll be staying at comfy lodging, we’ll spend the majority of this tour traveling in a boat looking for our photographic subjects. We’ll be sleeping outside, in tents, and under the stars while on tours that fit this category. Not only will we be sleeping outside, in tents, on these tours, we’ll also be carrying all of our own supplies out into the wild. Traveling by foot into the backcountry with large, heavy packs will make these tours the most physically challenging. We’ll be utilizing travel by Jeep, ‘safari style,’ while on this tour. Very little to no hiking will be involved as we explore via Jeep. Lodging can range from luxury bush-camps to eco-lodges to hotels. Please the specific trip itineraries for more information. Backcountry Journeys is in the business of providing not only photography tours but also real vacations where you will leave with lasting memories. We set ourselves apart through our commitment to offer the finest outdoor photography travel experience in the industry, regardless of the ‘style’ that suits you best!